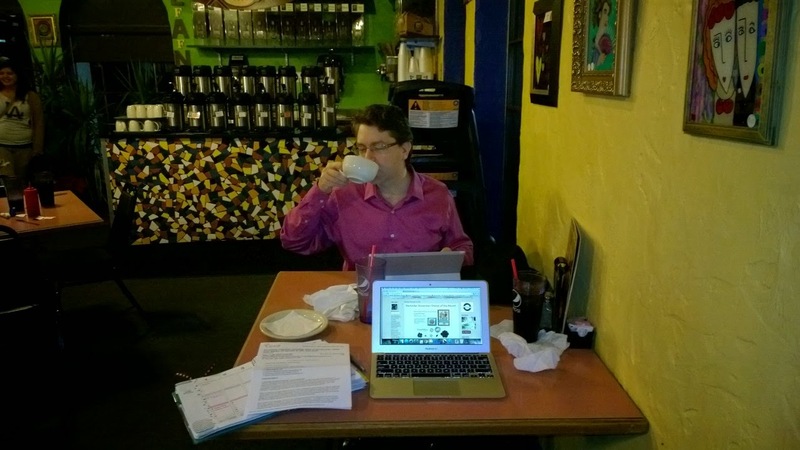 My favorite place to be when Mike and I want to hang out but get some work done at the same time is Cafe Brazil. It is a small funky coffee shop chain here in the DFW area. They are open 24 hours in the Richardson location which is perfect for our late night dates. The first order of business was food! The dinner I made was not so yummy and frankly I was hungry again. Mike and I split the Steak Quesadilla dinner then after we had our very first Brazilian Steamer. I think I am addicted! The Brazilian Steamer is just flavored steamed milk but OMG it is that good! Cafe Brazil has always been a very stimulating place for me. I started and finished my CTMH education here. I started with the Bachelors, then worked on the Masters and finally my PhD in scrapbooking right here. Tonight I find myself in blogging heaven.